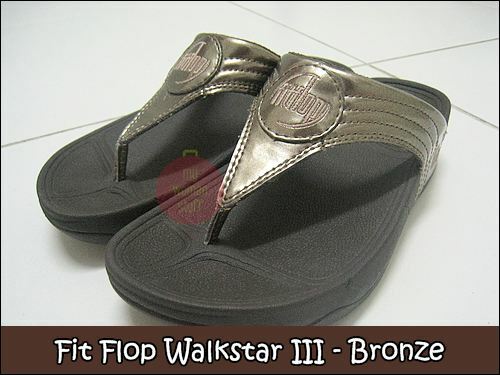 Home » Product Reviews » Fitflop Review : Was it Fit or was it a Flop? Fitflop Review : Was it Fit or was it a Flop? Slightly over a month ago, I succumbed to getting myself a pair of FitFlop slippers at the last Isetan sale. FitFlops as we will recall were made popular after being featured on Oprah (I base this on the internet and on the promo video they keep showing over and over) and by people who claim to have had their butts and legs toned after wearing them. So after 1 month of flipping and flopping around in them what do I think of the FitFlop? Does the FitFlop tone the legs and bum? Does the FitFlop pinch the toes since its a thong? Not for me. When you buy a FitFlop, make sure you get the correct size and get the sales assistant to help you. You should not hear too much of a flapping noise when you walk like conventional flip flops. You will also not grip the slippers that much for some reason. If you find either of that happening, its likely to be too large. The thong did not hurt my toes at all. Usually, I cannot wear thongs or flip flops because the bit between my big toe and second toe will hurt like crazy and blister within 10 minutes. I wore the FitFlop on shopping trips in the city and all over Penang without any problem. Love it! Does the FitFlop help your posture? One of the FitFlop’s selling points is that its supposed to help your posture. I don’t know if it does. I am more aware of my body and posture now that I do yoga so I do try to walk and sit straighter. I don’t know if the FitFlop helps but despite wearing it and walking everywhere for hours, my legs and back did not hurt. It might be doing something right. Does the FitFlop offer arch support? I have flat feet and yes, this is part of the reason I like the FitFlop. It offers me very good arch support so my legs don’t feel as tired when I’ve been walking a lot. Believe me, I walked A LOT in Penang recently. I love how it supports my feet. Does the FitFlop feel more comfortable than Crocs? If they’re as comfy as you say (and since I will still NOT put Crocs on my feet! ), would love to get me a pair, but perhaps when the next BIG sale starts eh? i have crocs too, but this is like 2x the price of crocs. it better be to good right? Not sure… try department stores instead of shoe stores? I fully agree with you re: flat feet. Its a right pain! My feet hurt after using these! So do my legs but I am concerned about my feet. Do they really offer arch support? Why do my feet hurt? I’ve no idea why – the website did say feet might hurt but it works for me. Perhaps its just not for everyone. May i know in Singapore where can i find these brand FitFlop shoes? Go to the fitflop official page to find the stores that have them. I bought mine at Hue Raffles City 1st floor.. I have 7 pairs of Fitflop and I must say I will never wear any other slippers or shoes anymore! I have flatfeet too and was wearing Crocs till my doc tell me to stop wearing Crocs as they don’t have arch support. I switched to Birkenstock but find it too heavy for walking long distance and the sole is pretty hard too. I got my first pair at Isetan Singapore during a sale for about $80++, subsequently I got the rest of them thru overseas site. Almost half of my office colleagues are wearing Fitflop after I recommended it to them. I wear Fitflop sun up sun down 7/7, even to work! Hai Kate , wow I want that to,where can I order online,?? Just brought my first pair of Fitflops last 1 Oct. I was pretty hesitant at first because it is equally pricey. I got this at Travel Club Greenhills (Manila). I am 4 months pregnant and temporarily stopped playing ice hockey because of my pregnancy. I decided to get a pair because I couldn’t find any shoe that can help relieve the growing stress on my back plus my growing lower body. Eversince I put these on, my legs muscles started to work again. It felt like when I finished hockey training! It’s truly amazing what these sandals can do. I even use it when I drive and it feels much better stepping on the clutch than when I had on a regular shoe! And miraculously the pain on my back started to lessen. Before buying you may need to follow the instructions on the tag saying you take 20-30 brisk walking steps in them to make sure you get the right fit. Even if I wanted to get the Pietra (ideal for slimmer feet) I ended up with the bronze walk star III because of my wide foot. Thus not all Fitflop designs are for everyone. I bought my Pietra yesterday and it is sooooooo comfortable. Worth the price I paid for it 🙂 && like you, I don’t experience any pain in my feet or legs although a few of my friends claimed to suffer the first few days of wearing them.